Senator Marco Rubio’s ‘golden boy’ status losing shine? Party and a likely presidential nominee for the 2016 election. 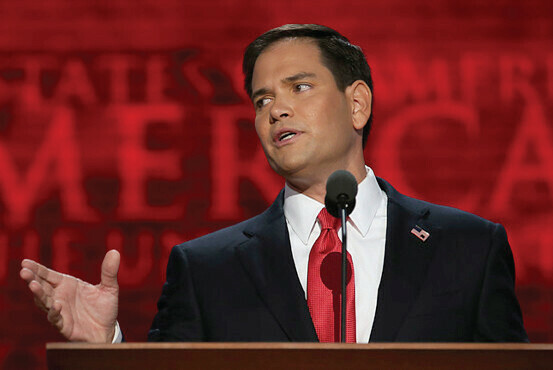 Senator Marco Rubio has long been touted as the “golden boy” of the GOP and a potential Republican nominee for the 2016 Presidential election. Rubio’s appeal stems from his relative youth and Hispanic heritage – two demographics the Republican Party desperately wants to attract. However, despite the hype, Rubio has been frequently called out by major news sources and activist groups for saying one thing and doing another. Rubio was one of the senators who opposed a bipartisan proposal on April 17 to expand background checks for gun buyers. Despite forcefully denouncing the effort on several talk shows in the days leading up to the vote and threatening to filibuster gun control legislation, Rubio admitted, in an interview with FOX News, he had not actually read the bill in its entirety. Neglecting to read bills prior to opposing them is not a rare occurrence among lawmakers, yet Rubio’s vehement public objection to the proposal led many to wonder if the senator was more concerned with appeasing the National Rifle Association (NRA) than the American people, roughly 90 percent of whom supported gun control legislation. Yet, that would be an oversimplification. Though Rubio may find it easy to gather support among the largely Cuban community in Miami where he resides, Cubans make up roughly 5 percent of the total Hispanic population in the U.S. and they have an easier time becoming American citizens than many immigrants from other nations. Rubio will be harder pressed to gain the backing of Hispanics of other nationalities, many of whom are not necessarily convinced he is sympathetic to their cause nor understanding of their hardships. But it is not just Hispanic voters Rubio has to worry about, he is poised to receive backlash from his own party members, who have become disenchanted with him, if the Senator fails to adhere to his image as a tried and true Republican. More recently Rubio has been pushing immigration reform as a member of the Senate’s “Gang of Eight,” a group of bipartisan lawmakers working to propose comprehensive immigration reform. Earlier in April, the group unveiled a plan that established an extensive multi-step process for those desiring to gain citizenship. Among other specifications, undocumented immigrants would have to pass multiple background checks, pay taxes, learn English and wait a period of at least 10 years before they can qualify for citizenship. According to those who are critical of his stance on gun control, this statement reeks of hypocrisy. Second-year Megan Shea who works with Unidos Now, an organization advocating on behalf of Southwest Florida’s Hispanic community, echoed the ambivalence to Rubio’s immigration reform. Failure to gain support from his party on this issue would potentially ruin Rubio’s chances of becoming a presidential contender. On the other hand, pushing for reforms that do not gain support from Hispanic voters could place him in equal peril. Political commentators agree that Rubio’s foray as the poster child for immigration reform is a potentially lethal double-edged sword. An article in Time magazine revealed that Rubio’s own mother warned him against meddling too forcefully with the issue of immigration. “Please, don’t mess with [immigrants],” his mother urged, cautioning him to be humane in his approach.